"What he has realized by his own supernatural knowledge he will publish to this universe. He will preach his religion, glorious in its origin, glorious at its climax, glorious at the goal, in the spirit and the letter. He will proclaim a religious life, wholly perfect and thoroughly pure; even as I now preach my religion and a like life do proclaim. He will keep up the society of monks numbering many thousands, even as now I keep up a society of monks numbering many hundreds". "It is said that I am not an only Buddha upon whom the leadership and order is dependent. After me another Buddha maitreya of such and such virtues will come. I am now the leader of hundreds, he will be the leader of thousands." And the Blessed one replied, 'I am not the first Buddha who came upon the earth nor shall I be the last. In due time another Buddha will arise in the world, a holy one, a supremely enlightened one, endowed with wisdom in conduct, auspicious, knowing the universe, an incomparable leader of men, a master of angels and mortals. The Blessed one replied, 'He will be known as Maitreya'." "We sent thee not, but as a mercy for all creatures." (ii) The words Mercy and Merciful are mentioned in the Holy Qur’an no less than 409 times. (iii) Every chapter of the Glorious Qur’an, except Chapter 9, i.e. Surah Taubah begins with the beautiful formula, 'Bismillah Hir-Rahman Nir-Rahim', which means 'In the name of Allah, Most Gracious, Most Merciful'. 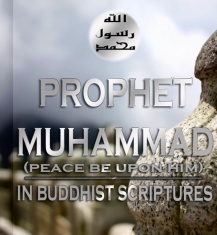 (iv) The Word Muhammad is also spelt as ‘Mahamet’ or ‘Mahomet’ and in various other ways in different languages. The word ‘Maho’ or ‘Maha’ in Pali and Sanskrit mean Great and Illustrious and ‘Metta’ means mercy. Therefore ‘Mahomet’ means ‘Great Mercy’. "I have preached the truth without making any distinction between exoteric and esoteric doctrine, for in respect of truths, Ananda, the Tathagata has no such thing as the closed fist of a teacher, who keeps something back". "Then the Blessed one addressed the brethren, and said, ‘Whosoever, brethren have been Arahat-Buddhas through the long ages of the past, they were servitors just as devoted to those Blessed ones as Ananda has been to me. And whosoever brethren shall be the Arahat-Buddhas of the future, there shall be servitors as devoted to those Blessed ones as Ananda has been to me’." The Servitor of Buddha was Ananda. Muhammad (pbuh) also had a servitor by the name Anas (r.a.) who was the son of Malik. Anas (r.a...) was presented to the Prophet by his parents. Anas (r.a...) relates: "My mother said to him, 'Oh Messenger of God, here is your little servant'." Further Anas relates, "I served him from the time I was 8 years old and the Prophet called me his son and his little beloved". Anas (r.a...) stayed by the Prophet in peace and in war, in safety as well as in danger till the end of his life. i) Anas (r.a.), even though he was only 11 years old stayed beside the Prophet during the battle of Uhud where the Prophet’s life was in great danger. ii) Even during the battle of Honain when the Prophet was surrounded by the enemies who were archers, Anas (r.a...) who was only 16 years old stood by the Prophet. "The Blessed one said, ‘There are two occasions on which a Tathagata’s appearance becomes clear and exceedingly bright. In the night Ananda, in which a Tathagata attains to the supreme and perfect insight, and in the night in which he passes finally away in that ultra passing which leaves nothing whatever of his earthly existence to remain.’ "
i) A Buddha attains supreme and perfect insight at night-time. iii) A Buddha dies a natural death. iv) He dies at night-time. v) He looks exceedingly bright before his death. vi) After his death a Buddha ceases to exist on earth. i) Muhammad (pbuh) attained supreme insight and Prophethood at night-time. "By the books that makes thing clear – We sent it down during a blessed night." "We have indeed revealed this (message) in the night of power." ii) Muhammad (pbuh) instantly felt his understanding illumined with celestial light. iii) Muhammad (pbuh) died a natural death. iv) According to Ayesha (r.a.), Muhammad (pbuh) expired at night-time. When he was dying there was no oil in the lamp and his wife Ayesha (r.a.) had to borrow oil for the lamp. v) According to Anas (r.a.), Muhammad (pbuh) looked exceedingly bright in the night of his death. vi) After the burial of Prophet Muhammad (pbuh) he was never seen again in his bodily form on this earth. "The Jathagatas (Buddhas) are only Preachers." iii) The most successful in the world. vi) An example to others in deeds and in words".